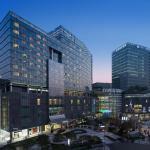 Enhanced Performance Separations: Analytical Techniques & Laboratory Management is organized by Lexis Conferences Ltd and will be held from May 15 - 16, 2019 at Courtyard by Marriott Seoul Times Square, Seoul, South Korea. This CME Conference has been approved for a maximum of 16 CME Credits. Analytical Techniques'19 extends it's warm welcome to invite all the eminent scientists, professors, business delegates and all the participants from different departments of Chemistry. The main aim of this conference is to promote the current advancements and trends in different analytical techniques and to enhance the knowledge of the young researchers by providing a platform to interact with the scientists and eminent personalities which help them to advance thier research work. Come, visit, explore and experience the taste of analytical chemistry and it's techniques along with the beauty of South Korea. Analytical Techniques'19 aims to cover the subjects which are traditional and the core of the fields of Chemistry like organic, inorganic, physical and analytical chemistry, which also plays a major role in providing insight to non-specialists where chemistry is a significant component of interdisciplinary research. These topics may include but are not limited to: chemical biology, chemical physics, materials science and nanotechnology. The conference also has a main aim to bring the attention of the topics beyond academic research with particular focus on chemistry education and research outside the academic environment.